The Codex Calixtinus is named after Pope Calixtus II (1119-1124) who is said to have written much of it. I naively hoped to see the manuscript when on my own pilgrimage to St. James’s shrine in 2009 but found that it had been stolen two years before. It is now returned to the cathedral but under stricter security. It consists of a book of homilies for the daily offices and for the feast days of St. James. The main one falls on July 25th but also there is the Passion of St. James on December 30th, which ironically is when I am again listening to this recording. Another section, book five in fact, is the famous Pilgrim’s Guide mentioning the routes one might take to the shrine – well worth a read, and quite amusing. The music, found in Book 1 and largely monodic, consists of antiphons and psalms of praise. This CD includes five of each. 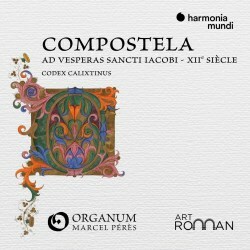 A hymn, a response in primitive organum and a Magnificat are bookended with the pilgrim’s Hymn Dum Pater familias (almost an anthem for pilgrims) and a processional conductus at the beginning, and a Benedicamus Domino and the unique three-part conductus (for the period early 12th Century) Congaudent Catholici at the end. The latter is attributed to Magister Albertus of Paris and in the style akin to the Aquitanian polyphony of the time. This is all set in the context of a reconstructed Vespers for one of the Saint’s feast days. Incidentally the psalms have been shortened for the disc, because the service would have lasted up to two hours. Quite a portion of the manuscript has been recorded before. One disc I especially admire is the recording by Sequencia under Benjamin Bagby (deutsche harmonia mundi RO 77199). No rhythms can be interpreted happily from the manuscript, so they take the view that there was little strict rhythm. One finds a great freedom in their approach, as a consequence. Pérès in his excellent booklet notes remind us that “this music is not easy to perform even for specialists”. He says that earlier performers firmly decreed that “plainchant could not have a regular beat” because “it was incompatible with the spiritual nature of the music”. So he performs these pieces with a regular pulse “breaking free of old aesthetic canons”. If you can, compare his performance of Congaudeant with Bagby’s and you will understand what he means. All very laudable and interesting, you might think. I like the idea in practice but it seems to me that the result is mostly tedious. First, the pulse brings out a feeling of plodding through the notes, especially in the lengthy psalm settings made worse by largely employing the same dynamic and vocal colour. Second, no matter what the period or style Pérès has singers who sound always like a group of Greek Orthodox monks and middle Eastern potentates, be it in music from the 14th Century ‘ars subtilior’, Chants for the Jerusalem church, northern French organum of Leonin or Spanish monody. He says that his approach adds timbre and energy. I have nothing against the ornamentation or some of the vocal gestures but after over an hour of his approach to this music I feel as if I need a breath of fresh air and a relief from the holy smoke. Ensemble Organum consist of eight male voices including Pérès himself, each of whom is allotted a solo at some point. They blend well and understand exactly what the director requires of them. Sadly, although the essay is very interesting and in many ways worth the cost of the disc, no texts are supplied which is not only frustrating but is distinctly unhelpful. You can find them, however, on Harmonia Mundi’s website.